I had heard runners behind me since the last aid station. Now that we had passed the 8000′ high point of the course and were headed downhill, the group was going to pass me. I was at about mile 47 of the Kodiak 50 Mile race, and trying to shake off some demons that had been plaguing me for the last 7 miles. It was my fourth Kodiak 50M and except for these last few miles it had been a mostly enjoyable day on the trails and forest roads of Big Bear Lake. There is no better run than a run in the mountains, and for my money no better 50 Mile race in Southern California than the Kodiak 50M. The Kodiak races (100M, 50M, Front 50K, Back 50K) have a character all their own, and at least for now — no lottery or histrionics. Just enter, train hard and then run! Early in the race on Snow Slide Road. The race had started before dawn near Fawnskin, on the north side of Big Bear Lake. It had been a chilly forty-something degrees at the trailhead, but warmed quickly as we ascended the Grays Peak Trail. Today would be the first day of a record-setting heat wave in SoCal and temps for the race would be the warmest in its five year history. 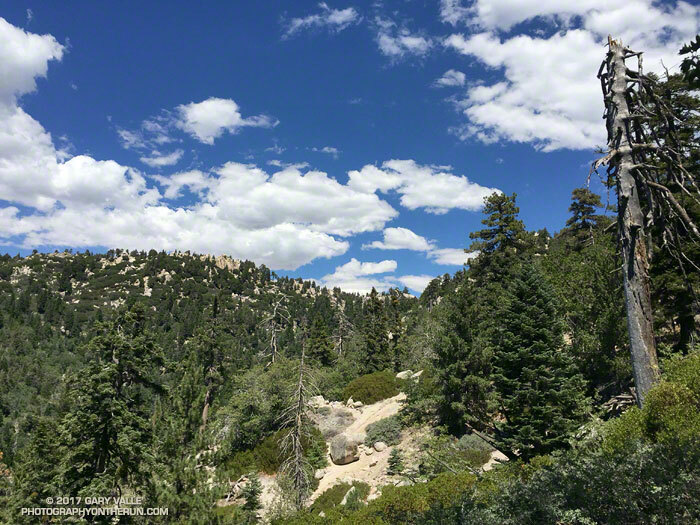 By the time we reached Snow Valley and were descending the windless, exposed, south-facing slopes of Bear Canyon, the “in the sun” temps would be around 100. The highlight of the 50M race for me is the climb out of Bear Canyon on the Siberia Creek Trail. This classic 7 mile ascent gains around 2910′ from Bear Creek (4770′) to the Champion aid station (7680′). 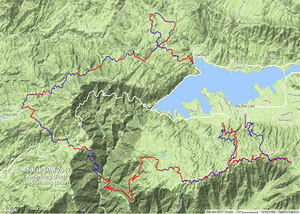 You only get to do the Siberia Creek climb when the 50M is run counter-clockwise around the west end of the lake. This has been the case each year except for 2016. 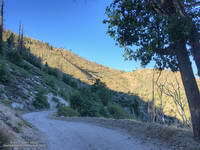 The descent into Bear Canyon and climb out on the Siberia Creek Trail. Click for a larger image. Expecting it to be hot and knowing how tough this climb can be, I filled my Camelbak(TM) to the brim and also took an extra bottle. (Thanks Aaron and Lacey!) What I didn’t do was take the time to cool off in the stream. A couple minutes of cooling here might have helped keep the race demons at bay. It was deceivingly cool in the shade of the trees along Bear Creek, but that didn’t last long. By the time I got to the top of the Siberia Creek climb I was just about out of water, dehydrated and over-heated. I laughed when I thought about how cold it was here in 2013. That year racers resting at the Champion aid station huddled in blankets and sipped hot soup to try and stay warm. Not today! I tried to take the time to rehydrate, but the clock was ticking. I grabbed a cup of ice and started up the fire road. Elevation profile for the Kodiak 50M. Click for a larger image. Though still generous, the cutoffs for the 50 milers have been substantially tightened since the 2015 event. Descending from the Grandview aid station to the Aspen Glen aid station I knew I was close to the cutoff and that was confirmed when a runner coming up the trail told me I only had 5 minutes remaining. The aid station personnel at Aspen Glen were phenomenal and I was in and out of there with water, my headlamp, and a couple of GUs in 48 seconds. I was excited to have made the cutoff, but knew I was going to have to push it to make the Finish by 9:00 p.m. I had forgotten just how far east the Pine Knot Trail goes before ascending to Grandview. At one point it seemed the trail was going to descend all the way to the lake. I hadn’t seen a trail marker in some time and no other runners were in sight. I began to think I might have missed a turn and stopped to look more closely at the tracks on the trail. The imprints of a Brooks Cascadia and Altra Olympus stood out from the others. They were as good as a trail marker, and assured me I was still on course. The ups and downs of the Kodiak 50M course. Click for a larger image. Eventually the Pine Knot Trail and I found our way back up to the Grandview aid station, but somewhere along the way I had become nauseated. Without asking, my body decided blood would be more useful for cooling and propulsion than for absorbing fluids and nutrients. My stomach had one message for me, “Sorry, we are closed!” It’s a common issue in longer runs, and given time, most runners work through it. Unfortunately time was at a premium; all I could do is ralph, turn onto the Skyline Trail, and take the first steps toward the last aid station. I felt a little better after that and could sip a little water. The good news was that along with the sun, the temperature and my water requirements would be going down. What wasn’t going down was the trail. My recollection of this section was that it was a long five miles, but I did not recall all the ups along the way. The last mile of the trail to the aid station paralleled the next section of the course and from time to time a runner would shout encouragement from the road above. I’d hoped to make it to the last aid station without having to stop and put on my headlamp and pulled into the station by the light of a quarter moon. Still nauseated, I put on my light and headed up the road. Like a wrangler movin’ stock down from the high country, sweep Vanessa Kline encouraged the group of runners. We only had about 3 miles to go. Most of the group did just that; they kept running and made the cutoff. Despite Vanessa’s best effort to get me moving a little faster, I crossed the finish line seven minutes after the 9:00 p.m. deadline. I would have liked to make the cutoff, but I’m OK with the unofficial finish. I wasn’t trying to get UTMB points or to qualify for a 100 mile — I was running Kodiak for fun. I like the course and the way the event is organized. I’ve had faster Kodiak times and I’ve had slower. What didn’t change was that I was still smiling at the Finish. Many thanks to R.D. Matt Smith, his supporting staff, all the volunteers, the sponsors, and runners. For all the results, photos and more info see the Kodiak web site and Facebook page. Also be sure to check out Kodiak 100M Winner Ruperto Romero’s interview on UltrarunnerPodcast.com. It’s a compelling and insightful story.